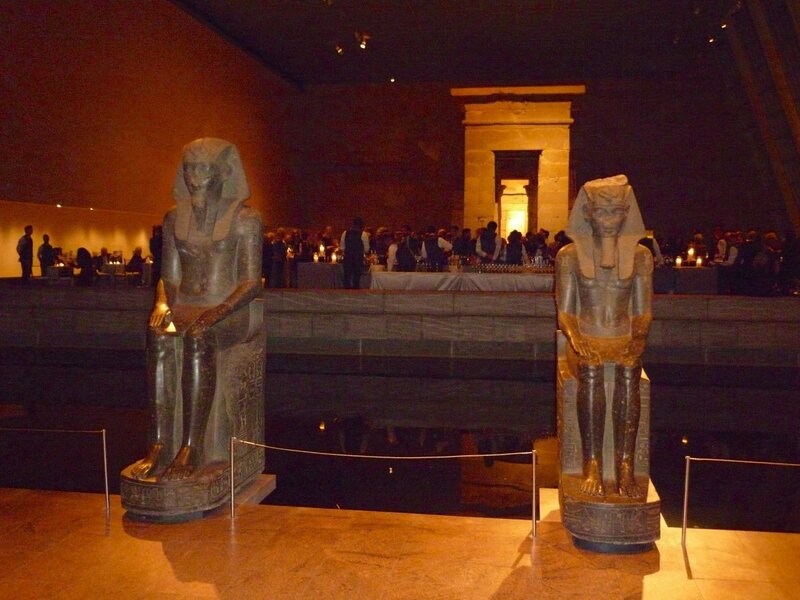 After perusing the exhibit of 60 ensembles that the Countess has either worn or designed herself, we congregated in the Temple of Dendur for champagne and effervescent chitter-chatter—a welcome relief after processing and reflecting on the recent tragic events in Paris. The Countess was meant to attend the opening but chose to stay in Paris to mourn with the victims’ families. This was definitely my kind of party, like the ones I used to attend in the ’90s and early ’00s. There were no tiresome celebrities in attendance—only fashion insiders, including Suzy Menkes, Valerie Steele, Patrick McDonald (my friend and date for the evening), Ike Ude and Amy Fine Collins. 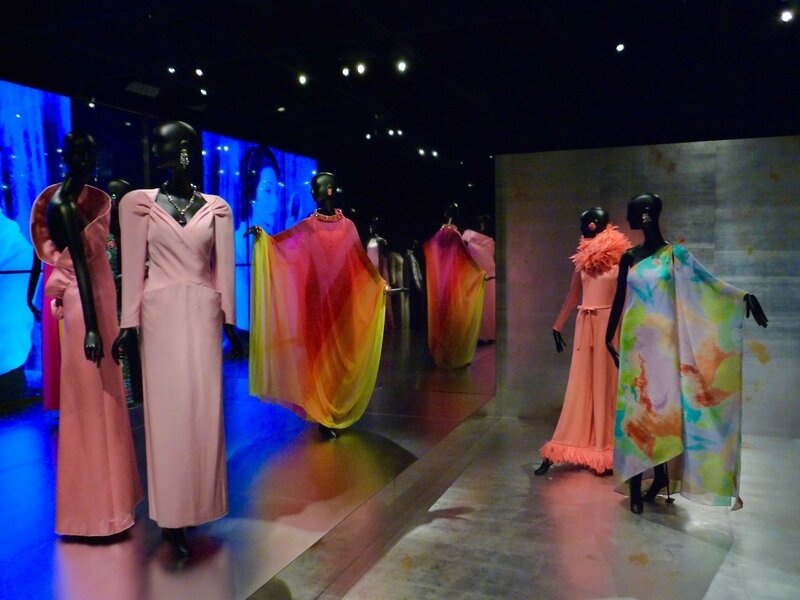 A technicolor miracle of chiffon by Marc Bohan for Dior, 1967. Only four women are known to have ordered this dress: the Countess de Ribes, H.S.H. Princess Grace of Monaco, the Mexican actress María Félix and the philanthropist Joanne Toor Cummings. What a delight it was to see Mary McFadden again after all these years. Her entrance caused quite a sensation and she became the star of the party. So chic. It brought back memories of when I used to cover the New York shows for the fashion editor of the New York Post when I was fresh out of high school, back in the ’90s. Me and Patrick McDonald arriving at the cocktail reception in the Temple of Dendur. Patrick is wearing a vintage Moschino suit. As Patrick tries to work out the new technology, Ike Ude is amused and Carolina Herrera looks impatient. When the Countess wanted the House of Dior to replicate one of her favorite designs from the ’50s the curator, Harold Koda, demurred. He had never seen a truly accurate reedition. Ateliers change, the period eye evolves, etc. But the Countess wouldn’t take no for an answer. Because of her photographic memory and ability to recollect the smallest detail of the gown she loved, the reproduction, pictured here, is a masterpiece of deception. I absolutely adored this Balmain ensemble (herringbone tweed with a lynx-fur trimmed cape) because it channels Marlene Dietrich. 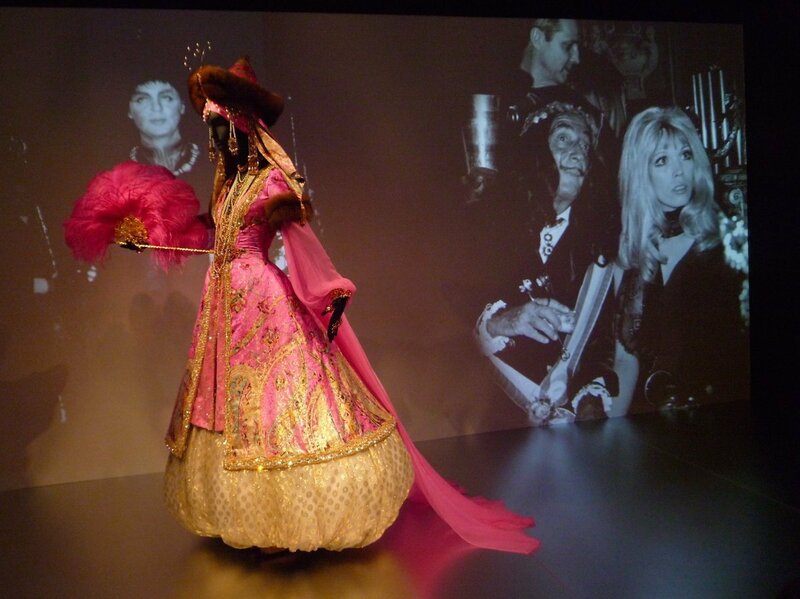 And indeed, it was conceived during a time when Hollywood glamour was influencing Parisian style, the 1960s. The fabulous Valerie Steele, whom I often interviewed back when I was writing for DUTCH magazine. 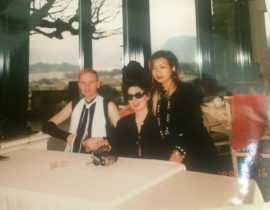 I had lunch with my close friend Professor Camille Paglia the day after this party, and she spoke warmly of the way Professor Steele has successfully elevated discussions of fashion in academia. Carolina Herrera and Amy Fine Collins. 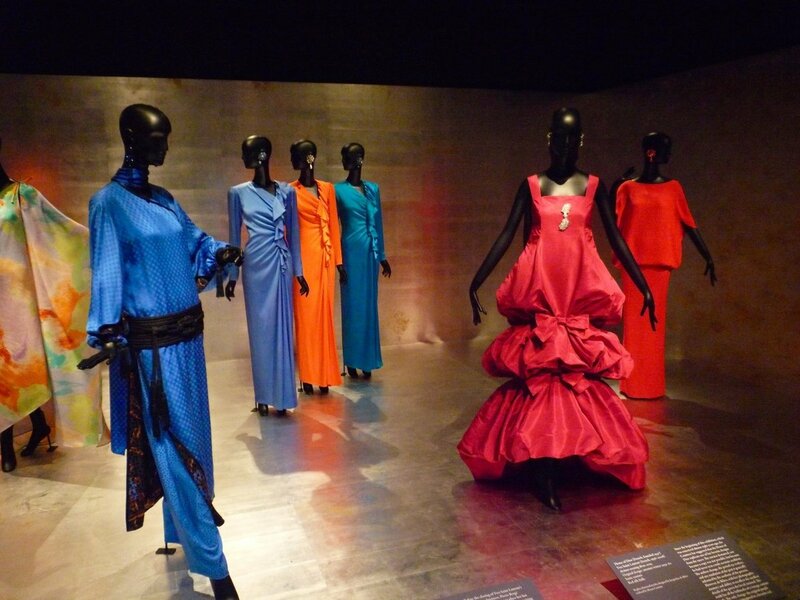 Yves Saint Laurent 2002 and a dress from Jacqueline de Ribes own fashion collection, fall/winter 1983-4. The Count tried to talk the Countess out of starting a fashion line because it was considered unseemly for an aristocrat to be involved in commerce. Finally, he gave his blessing but told her she had to raise her own money. So, she flew to New York and did just that. 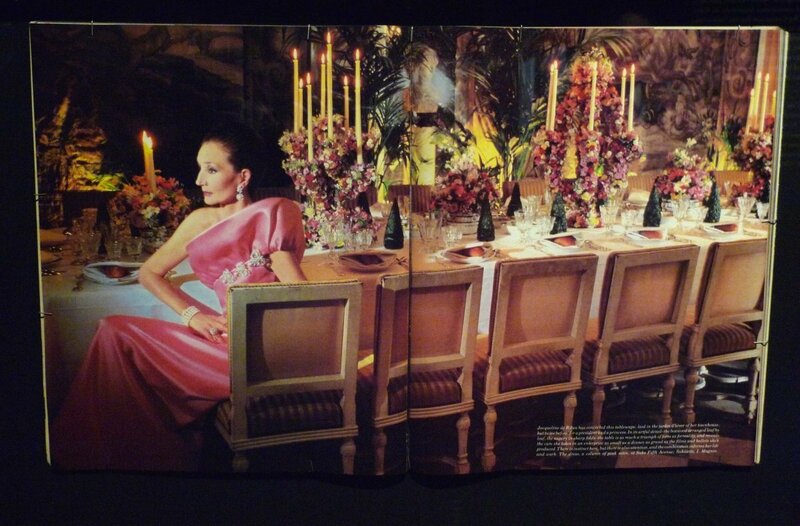 More pieces from Jacqueline de Ribes fashion collections in the ’80s. More Jacqueline de Ribes originals. Absolutely enchanting. Yves Saint Laurent 1968 and Jacqueline de Ribes 1986. A Jacqueline de Ribes original. Divine. Illustration of the Countess attending Alexis de Rédé’s Bal Oriental at the Hôtel Lambert in Paris, 1969. “This was the event of the Parisian season and Dali mockingly explained that those who weren’t invited made it known that they would be out of Paris, either skiing or traveling. ‘Is it absolutely essential to go to this ball, then?’ I asked. Marilyn Kurshner, Yeohlee Teng and Patrick. Legends walk among us: Mary and Patrick.